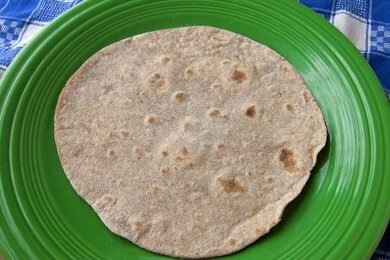 Make Your Own Whole Wheat Tortillas - So Yummy! See that tortilla up there? I made it! And, yes, I am proud of myself. Perhaps one of you could send me a gold star sticker? Why would I make my own tortillas instead of just buying one of the numerous packages in the supermarket? water, oat fiber, whole wheat flour, soy flour, vital wheat gluten, expeller pressed canola oil, contains less than 2% of each of the following, baking powder, sea salt, yeast, xanthan gum, guar gum, citric acid, I-cysteine, to maintain freshness (sorbic acid, calcium propionate). I guess I think that tortillas that have added stuff to keep them fresh aren't as good as homemade ones. The truth is that I don't really like packaged tortillas. They taste a bit like the plastic bag that they come in (sad). The recipe below is REALLY simple if you have a food processor. The entire tortilla dough making process was under 5 minutes. If you don't have a food processor, you could mix this in a bowl with your hands, but it will take you longer. Sadly, you must wait an hour for the dough to rest to allow the flour to soak up the ingredients before you cook them. One hour later, you can start heating your pan and cooking your tortillas - which is the best part! There was something so fun and satisfying about making tortillas. After you roll out your dough to your desired thickness, you toss it in a pan and wait for a bubble to form. Then, you flip it and cook a little more. Finally, you have this absolutely divine product to consume. My kids went absolutely nuts over these tortillas. They were a real treat! You can make a whole bunch and then freeze them for later consumption. I promise - these are worth the effort. The best way to cut calories with this recipe is to make them thinner and smaller. For example, if you make 20 tortillas instead of 10 (which is totally doable), you will have a 80 calorie (2 Points+) tortilla. If you try to take out the oil from the recipe, you will end up with something that resembles a cracker. In a food processor pulse both flours and salt. Add shortening and pulse until blended. Slowly add boiling water though tube until a wet dough forms. The tortilla dough should be just a little bit sticky. Form 10 balls of dough and rest on cookie sheet under slightly damp towel or plastic wrap for at least 1 hour or up to 8 hours. To cook tortillas, heat large frying pan on high heat. Roll out tortilla on floured surface until you reach your desired thickness. Place tortilla on griddle and cook until you see a bubble form. Flip tortilla and cook for about 30 seconds more. Roll out the next tortilla while the first one is cooking. Eat immediately, refrigerate, or freeze your tortillas. Thank you snack girl! Over the weekend I wanted tortillas for something I was making but the ingredient list kinda scared me so I got corn chips instead because the ingredient list was smaller - corn and oil. I was wishing I knew how to make my own tortillas & now I do! I am SO excited to get this recipe. I am pretty sure I have seen tortilla presses in the ethnic foods aisle of the supermarket for less than $10! Can't wait to try making these! Thanks! Yum! I love making homemade tortillas. I normally do it with white flour, due to family not liking grains, but I am going to try your recipe and then freeze them. Thanks! WOW! thank you so much! I was just out the store trying to pick out a "healthy" tortilla for my family and was shocked at the choices. The list of ingredients was a mile long (and most not pronounceable) for something that should be so simple... I will be making these today! I much rather give them something fresh than from a plastic bag any day! thank you! A tortilla press is wonderful for this. One trick to using the press is to cut out 2 circles the size of the press from a grocery plastic bag. Put dough between plastic, then press. Plastic is easily removed from dough. Plastic wrap/wax paper/tin foil is not as good as the plastic bag. Re-use the cut out by storing with press. Very fast and easy to use! Thanks Snack Girl - can't wait to give these a try - we will go for the '20' - soooo glad you included that tip! Have been following you since July and I KNOW you have helped me every DAY - 41 lbs. lost so far and I'm eating soooo much healthier and LOVIN' IT! I want to try these. I bet they are yummy! Smart & Delicious low carb/high fiber tortillas are still fewer PPs. Worth it for the price to me; but this will be great to hang on to if I ever get the hankering for homemade tortillas. Looks good! I just tried another recipe last week... similar but uses warm milk instead of water and only 2 tsp oil! thats great that u made these tortillas im proud of u we need more ppl to join my caterting business and bring their OWN skills. I have been making all kinds of tortillas since i was 5. in fact, I ONLY prepare ethnic dishes. COME JOIN ME. I've been wanting to make my own whole wheat tortillas for the longest time. You've just inspired me to actually do it! Thank you...this recipe sounds AWESOME! Another option is to get them from a local Mexican food store. We are lucky in that there is a tortilleria and panaderia close to us. Their Mexican pastries are to die for and very inexpensive, too. :) Mmmmmmmmmm. And YES you got the gold star sticker from me!!! @Mildred - I didn't try it with corn flour -but give it a shot - it could be super yummy. Thanks for the sticker! I made this recipe for Cinco de Mayo this year. I used them for burritos with a simple chicken recipe (cooked chicken tenders and a jar of salsa in the oven until done - I added brown rice, black beans and some avocado). I made the tortillas exactly as written and they came out really well. I only had trouble with the rolling out of the tortillas as the other ones cooked. I'm not that good with a rolling pin, so a couple of them got a little crispy while I was figeting with the next one. Still, they tasted great! I'll definitely be making these again whenever I need tortillas. I'm done with the store bought variety forever. Has anyone tried mixing these in a KitchenAid mixer with the dough hook? I've never used mine for that, and my food processor is a mini one that wouldn't fit this much food. I've been buying a high fiber/low carb ww tortilla lately, and I am afraid to go look at the label now. I try to limit my processed food, so I'd like to try these. My dough was way too sticky.... This recipe didn't work well.